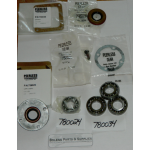 1185587 Bolens Driveshaft Bearing Kit 118-5587 1185588 Fits 800,850,900,1000,1050,ect. 1185-588 FREE SHIP! 393397 GENUINE Briggs and Stratton Fuel pump kit Briggs and Stratton 393397 fits Bolens ST series MADE IN THE USA !